The Rode RODECaster Pro Studio with Dual PodMics and Dual Broadcast Arms Kit from B&H includes the RODECaster Pro integrated podcast production studio with AC adapter, two PodMic dynamic podcasting microphones, two Auray BAI-2X two-section broadcast arms with internal springs and integrated XLR cables, an Auray SHM-SCM1 suspension shockmount for a large diaphragm microphone, and a PSM1 shockmount for the Rode Podcaster microphone. 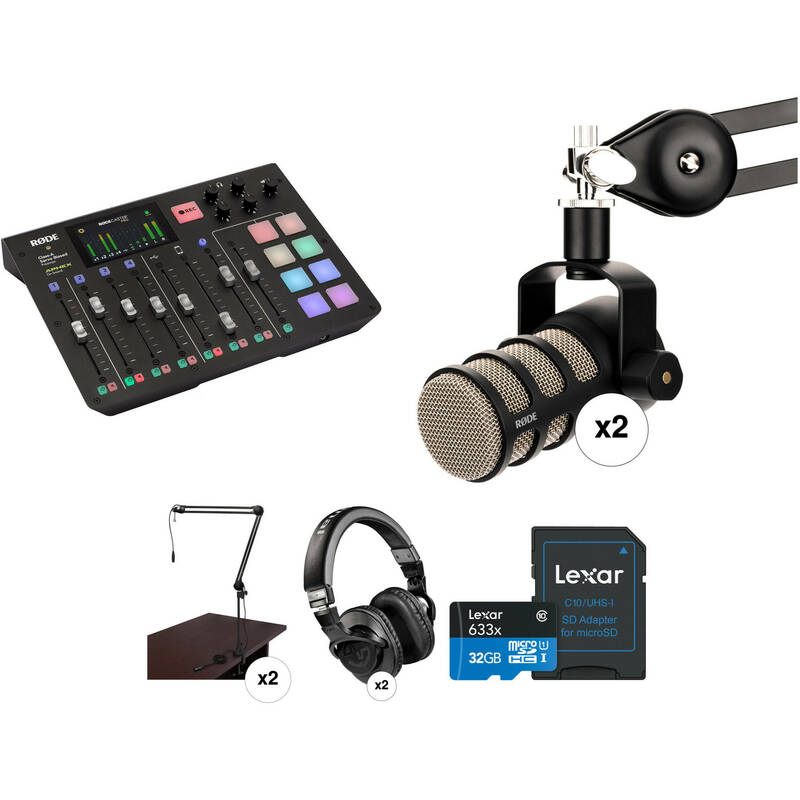 This kit can be used to integrate a mixer, sound effects player, two microphones for talent, a phone tap for taking phone calls, a recorder, and more, to simplify the aspects of podcast production in the studio or on the move. Offering an internal recorder and a host of podcast-friendly features, the RODECaster Pro lets you produce and mix podcasts on the fly with up to four microphones, music, prerecorded segments, and remote guests on calls all going on at once. The unit offers mix-minus functions over the TRRS, Bluetooth, and USB connections facilitating echo-free interviews via phone or app calls. With smartly designed features like main host channel controls, programmable sound pads for launching jingles and FX, and APHEX processing that gives your voice the rich and warm sound of a professional broadcaster, this console is destined to become a standard in the field of podcast production. The RODECaster Pro goes beyond what a traditional mixing console does. It is equipped with four high-quality XLR mic inputs, four discrete headphone outputs, eight faders to control audio levels, and Bluetooth, USB, and TRRS connectivity. The unit captures audio internally to a microSD card or to your computer via USB, and its flexible workflow lets you record a mixed-down stereo file for fast uploading to your hosting service while also recording each of the sources to its own track for later post-production. With automatic level setting and one-touch recording to the onboard microSD card, you can start recording your first podcasts within minutes of taking the RODECaster Pro out of the box. Onboard presets for a variety of microphones deliver broadcast-quality sound with a single touch. Prevent echoes: simply connect your smartphone to the RODECaster Pro via Bluetooth or TRRS cable, or to your computer via USB, and the unit automatically provides a mix-minus, preventing the person on the other end of the call from hearing a distracting echo. The RODECaster Pro is equipped with advanced audio processing options for each channel. From a list of mic profiles, choose the one that is most similar to the actual mic you are using on your voice, and the software will automatically match the digital signal processing to that microphone. The RODECaster Pro features an internal microSD card recorder capable of recording a stereo “live mix” of your podcast along with 12 additional tracks for each of the sources—one mono track per microphone and a stereo track for each of the following: the USB source, the 3.5mm TRRS input, the Bluetooth stream, and the summed output of the sound pads. This means you can connect the unit to your computer via USB and record 12 tracks of individual sources along with a stereo mix of your podcast to your favorite DAW or recording software. You can also bring in audio from your computer to the dedicated USB channel on the RODECaster Pro. Each person has an individual volume control so that they can monitor comfortably while recording the podcast. For convenience, the host channel has the option to plug a set of headphone with a 3.5mm plug directly into the front of the unit. Box Dimensions (LxWxH) 16.5 x 13.5 x 5.0"